SAN DIEGO -- Kenan Christon has discovered what dieters have known forever -- gaining weight is a lot easier than losing it. The Madison High sprinter, who medaled in both sprints at the State Meet a year ago, hasn't run as fast as he'd like this season and he's pretty sure why. 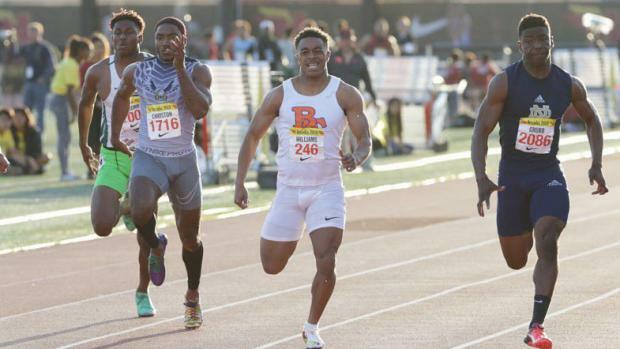 "I feel heavy in my upper body," said Christon, who clocked a 10.77-second time in the 100 to win the 3rd Annual Jim Cerveny Invitational Saturday at Mission Bay High. "I added weight for football since last year and I feel it. I can bench press 315 pounds, which is good for football." It'll help Christon when he steps on the football field at USC in the fall. Added weight isn't suggested for sprinters without a lot of added power and so far he hasn't seen better results on the stopwatch. His winning time was marginally better than the 10.79 he clocked a year ago but not nearly as fast as he hoped to run nor as quick as he might have run had not there been a false start in the first race. "That was my best start -- ever," said Christon, who came back to capture the 200 in 22.00. "The second false start (in the 100) was on me and I didn't want to get another false start, so I sat in the blocks, being cautious. "On the first start, I could swear I heard gun click before it started." Christon's teammate, sophomore Aysha Shaheed, swept the girls' sprints, winning the 100 in 12.24 and the 200 in 25.11. She credits Christon for her success, which included winning the section 100 a year ago. "We've known each other since we were little," said Shaheed. "He's like a big brother to me. He gives me tips and tries to get me to run the sprints in practice with the boys because he knows it'll help me. I do it sometimes and I beat some of the boys." She tried to keep things in perspective, staying humble while realizing she's still just a sophomore running against mostly juniors and seniors. This is the time of the year the top athletes are looking to lowering their times heading into the last few weeks of the regular season. When they don't improve, quality athletes like San Diego High hurdler Sonia Redon get frustrated. Redon, who clocked hurdle times of 14.38 in the 100 and 45.46 in the 300 in the section championships last year, went 14.79 and 46.77 Saturday, which is back of her seasonal PRs of 14.64 and 46.69. "I wanted a PR (in the 100 hurdles)," said Redon, a senior with a 4.7 GPA who has been accepted to Cal. "I hit the girl next to me but I'm looking to run 14.3 something at Mt. SAC next week. "Competition will really help me. I don't have a very fast start but if I can get out, I do my best over the final 50 meters. Track is a great balance between team and individual sports. I'm doing a lot of repetitions now -- like going over 100 hurdles every day." Chula Vista High Tech High's Drake Prince clocked the third-fastest 800-meter time this season in the section when he ran a 1:56.42, leading three runners under 1:58. La Jolla's Sierra Roberson, a 2:13.31 half-miler two years ago, has dropped that event and captured the 400 in 58.48 seconds. South Pasadena's Tianhao Wei swept the horizontal jumps, hitting 21-10 in the long and 46-feet in the triple. Wei was a State Meet finalist in the triple jump last year.